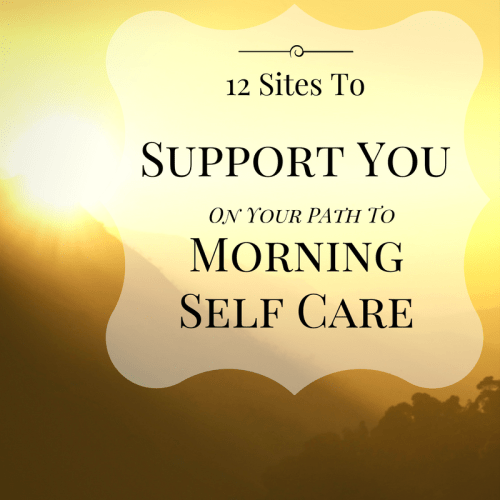 Is Self-Care In The Morning Not Working For You? For those of you that find mornings too difficult to carve out that time for yourself and have found it later in the day, wonderful! It is 100%, hands down, exponentially better to have that time, then not. I encourage you to continue on your journey to making you a priority and celebrate that. For me personally, I’m convinced that the reason I’ve been able to stick to my habits of self-care after 15 years is because of the magic of soaking up that pregnant silence just before the sun rises. In the beginning of making these morning habits, there were many stops and starts. In having to trudge through, once again, the phase of being a groggy mess all day because my body was up earlier, it was that giddiness in my belly when I remembered how good it felt to see that radiant, unfailing, burning constant we all depend on, rise up the day before, that motivated me to continue. There is no doubt about it, having uninterrupted time to yourself for things that delight you, expand you, strengthen you, center you and bring clarity changes everything for the better. To start your day with what empowers you before the rest of the world gets a word in, is a powerful, free and simple choice that quickly compounds and changes the stratum of your life. For your browsing pleasure I have made a list of great resources to support you on your journey to changing your habits and harnessing the start of your day for what’s most important. S.J. Scott is stellar at consistently providing thorough, well researched and motivating content regarding everything on habits. James gave me a fresh perspective on why incremental efforts towards change work. He provides densely researched articles on the different aspects of making change to living more purposefully. A site that has followed the journey of Leo Babauta in making healthier habits since 2007. He has grown an amazing community of people making healthier habit changes. Awesome book detailing the rituals of famous artists, writers, philosophers, scientists and politicians. Awesome podcast on everything regarding rising early and productivity. Full of inspirational interviews and useful recommendations on everything from productivity software and apps to diet changes. Upon reaching a low point in his life Hal Elrod tapped into the power of using his morning time for self-development and changed his life for the better. He has written many books that have excellent real life examples of people who wake up earlier to devote themselves to their own morning personal time. Yummy, healthy and fast breakfast recipes that satisfy. I’m can’t wait to try the egg breakfast muffin and swap the bacon for feta cheese! I personally enjoyed the huevos rancheros on a crisp tortilla tostada! Great article with resources of sites that offer free yoga sessions online. A site that offers workout routines that work all areas of your body. You can find exactly what you’re looking for by customizing your search by how much time you have and what exactly you want to get out of the workout.